Flipkart OMG Days sale: The e-commerce site Flipkart is back with some exciting deals and heavy discounts. The company is offering several deals of clothes, bags, electronics and mobile phones. 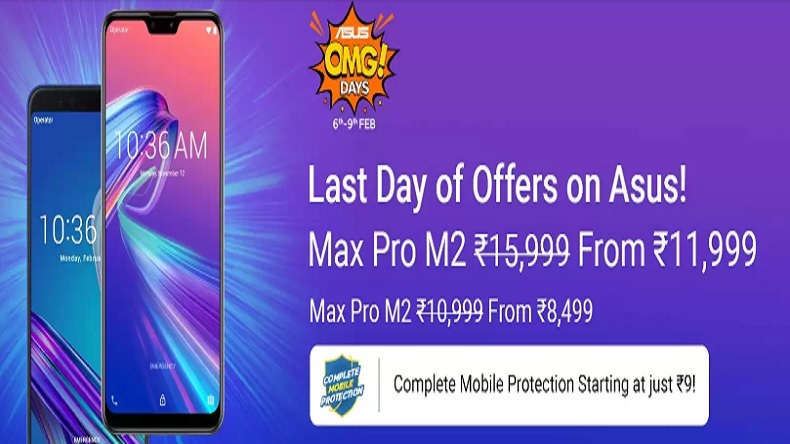 Flipkart's OMG sale was started on February 6 to 9, 2019, and today is the last day to avail heavy discounts of Asus Mobiles. Flipkart OMG Days sale: The e-commerce site Flipkart is back with some exciting deals and heavy discounts. The company is offering several deals of clothes, bags, electronics and mobile phones. Customers can avail heavy discounts and today is the last day of Flipkart’s OMG days. The sale on Asus mobile phones was started from February 6 to 9, 2019. According to the Flipkart’s website, the company has already sold 2 million + units in 2018 and now they are eyeing towards a new record. Flipkart also tagged the smartphone as India’s number 1 choice of experts. The Max Pro M2 has comes with Gorilla Glass 6 and it is powered by with Snapdragon 660. The ASUS Max Pro M2 comes in 2 variants— 3 GB and 4 GB —which costs 11,999 and 13,999 respectively. The smartphone has a big touch screen and comes with fingerprint and face unlock feature. The smartphone was launched about a month ago in December 2018, which comes with a big battery of 5000 mAh. The customers can buy the device in 2 colours Blue and Titanium. The phone works on Qualcomm Snapdragon 660 and comes with 4 GB RAM and 64 GB internal memory. The user can expand the storage capacity up to 256 GB using Micro SD card. Asus Max Pro M2 smartphone can be called as a camera phone too as it has 2 rear cameras (12-megapixel (f/1.8,1.25-micron)+5-megapixel). The company has mounted a powerful 13-megapixel front Camera (f/2.0, 1.12-micron), which comes with a front flash to capture best photos in low light. The smartphone is available in 2 variants, 3 GB and 4 GB, and the buyers have to pay a little amount of 11,999 and 13,999 respectively, which won’t even put a burden on one’s pocket. The Flipkart is also offering no-cost EMI offer on the smartphones.